Marketers, rejoice! 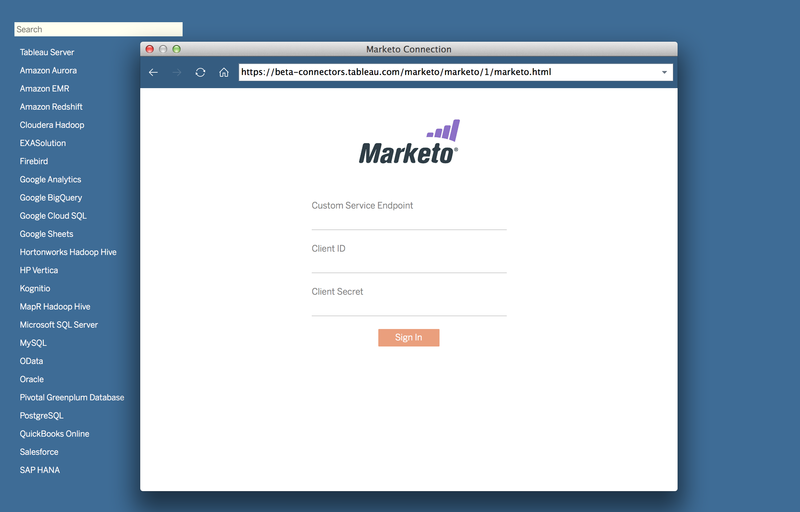 We are excited to announce our new Marketo connector is now available. This new connector means you can connect directly from Tableau to see and understand your campaigns, leads, and lead activities—no ETL, data warehouse, or spreadsheets required. Here’s how to get started with the connector. Tableau’s approach to cloud is all about choice, and we want to enable you to work with all your data, no matter where it resides. That’s why we introduced the Web Data Connector as part of Tableau 9.1. And you, our amazing Tableau community, have blown us away by using the Web Data Connector Software Development Kit to create connectors to all sorts of new applications and web data. And you’ve even shared them on GitHub. I recommend checking that page regularly for new connectors. What do you mean by "Beta page", when grabbing the Web Data Connector url? I can't seem to find that url. Thanks!